Safe Haven wheelchair securement and occupant restraints meet the requirements of FMVSS 209 & 302. They also meet the requirements of SAE J2249 which includes a frontal impact test conducted at 30 mph, 20g using a forward facing surrogate wheelchair with a mass of 85kg (187 lbs) and an ATD (adult sized test dummy) with a mass of 76.3kg. (168 lbs). 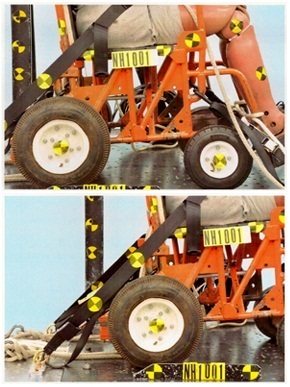 The Safe Haven sled tests are performed and documented at the University of Michigan testing facility. Safe Haven maintains quality control procedures and process per MIL-I-45208A. We are also members of associations comprised of tie down manufacturers globally, AWRF & WSTDA. We participate in establishing specifications and standards for tie down products for various markets. Doing so keeps us abreast of the latest in product safety and fabrication practices.